Hover your mouse over the Publish button. 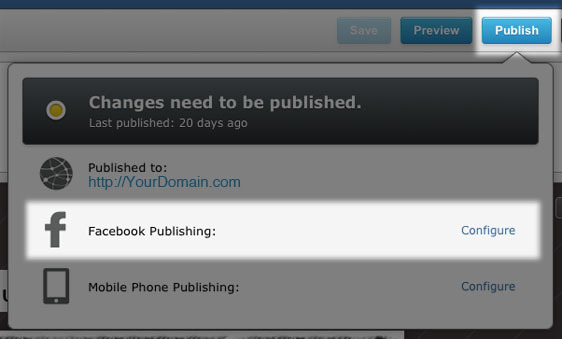 Next to Facebook Publishing click on Configure. In the dialog box that opens, click on Connect with Facebook. You will be taken through the process, which includes a one-time sign-in to your Facebook account. This is done to allow the Sitebuilder to communicate with your page and publish to it. Your Facebook Page will automatically be updated when you republish your LinkskyVISUAL site. A LinkskyVISUAL site can be connected to only one Facebook page. If you connect your site to a new Facebook page, the previous connection is broken and the tab on the first page won’t resolve. If you’d like to create tabs on multiple Facebook timelines, we suggest you create multiple LinkskyVISUAL websites. You can create a new Facebook page here. If you'd like help getting started on Facebook, just Ask.